The Lone Vegan. 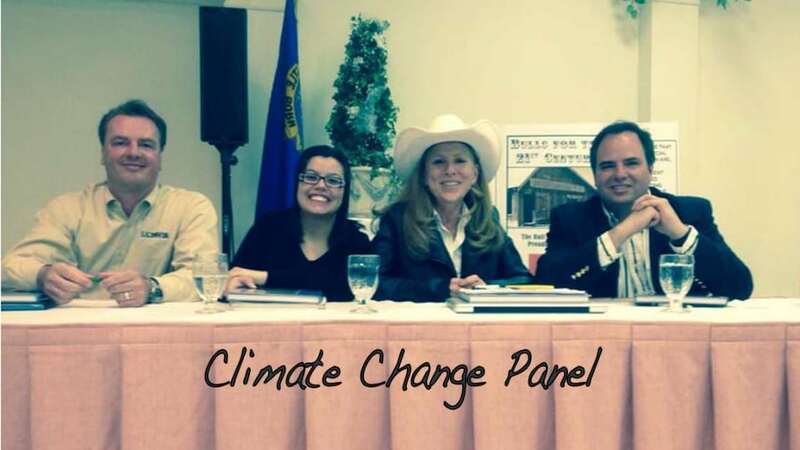 At the beginning of 2014, I was invited by the owner of a feedlot in Yerington, Nevada to give a vegan perspective on climate change to 250 cattle producers and ranchers on the night before their annual bull sale. I was the lone vegan on a four-person panel including a climate change skeptic and an advocate of animal agriculture intensification. I was also asked to sing the National Anthem. The REAL Documentary: Preaching To The Fire. Since founding REAL in 2011 it has been my goal to produce professional video content for our website. Over the past few years we’ve created numerous high-quality food shows and news programs that are used to instruct and inspire our site’s visitors including first timers who are curious about transitioning to a plant-based diet, and the seasoned pro needing content for their own websites and programs! This year, 2014, marked our entrance into the full-length documentary feature category with our first 70-minute film entitled The Lone Vegan: Preaching To The Fire! The film is the video account of my talk and song in Yerington. In 2014 we made Preaching To The Fire available for free to our followers and we have received overwhelmingly positive responses throughout the year. 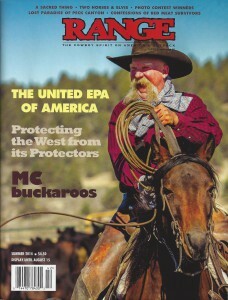 We’ve been featured in several magazine articles including one in Range Magazine! Can you believe it? 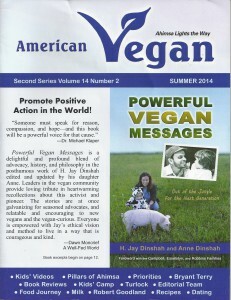 A publication for cattle producers featured the Lone Vegan! Now that’s what I call a first! The REAL App was born. 2014 saw the launch of the REAL App! 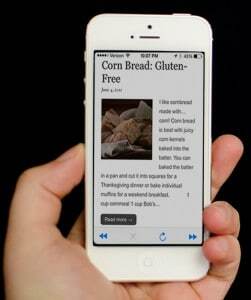 We’ve made it available to download to anyone who wants it, FREE for the iPhone, iPad or any Android device to access all of our recipes, videos, podcasts and articles. We’ve added dozens of new recipes and podcasts this year alone, and with the REAL app it is easy and convenient to find them. Kale Research. We have partnered with Master of Science candidate in Biomedical Sciences at Mississippi College, Bilal Qizilbash to support and promote his research breakthrough: Juiced curly kale kills melanoma cancer cells in culture. The research is ongoing and we look forward to sharing more results from this work. Ongoing Programs. We continue the It’s All About Food transcription project whose goal at the beginning of the year was to transcribe all of the program’s podcasts since the show began in 2009. I am happy to say we have transcribed over 4 years of weekly programming. In addition, we added 86 new It’s All About Food interviews with doctors, nutritionists, chefs, athletes and activists in the plant-based food, sustainable living movement including Center for Food Safety’s Elizabeth Kucinich; medical doctors Michael Greger and Caldwell Esselstyn; independent journalist Will Potter; Cowspiracy directors Keegan Kuhn & Kip Andersen; Food Empowerment Project founder Lauren Ornelas; Food Not Bombs cofounder Keith McHenry; Steve Wise, lawyer and president of the Nonhuman Rights Project; RD nutrition experts and authors, Brenda Davis and Vesanto Melina; Bart Potenza and Joy Pierson, co-owners of the Healthy Candle Restaurants in Manhattan. REAL was an exhibitor at the annual Manhattan Veggie Pride Parade and I was one of the speakers. A portion of my talk is contained in The Lone Vegan documentary. 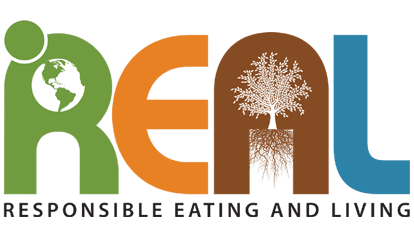 Responsible Eating And Living was featured in the American Vegan Magazine and the food and wine issue of San Diego Jewish Journal. 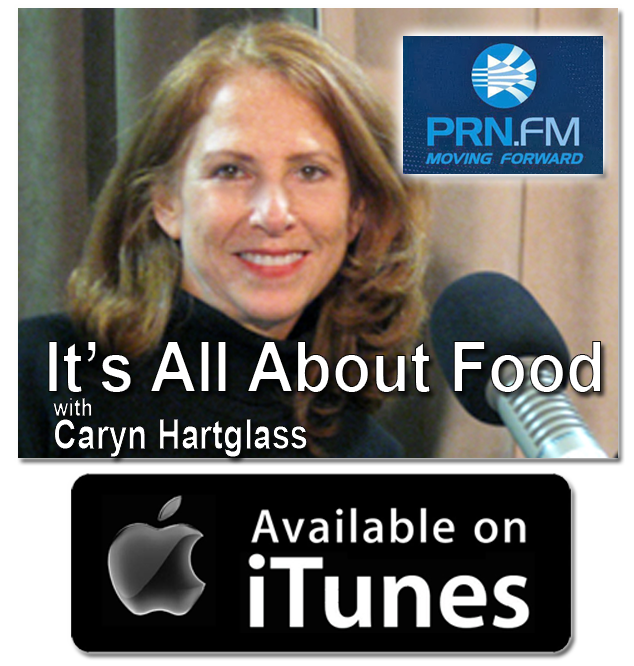 I was interviewed on Main Street Vegan with Victoria Moran and Healthytarian Living hosted by Evita Ochel. It is heartwarming to be recognized for the work we are doing. Thank you for supporting our work – making it easy, delicious and fun to eat well, be healthy and nurture our precious home, planet Earth. Here’s to a REAL happy, healthy, delicious 2015! Are you for REAL? Your generous donation will help us to continue what we have started and do so much more. 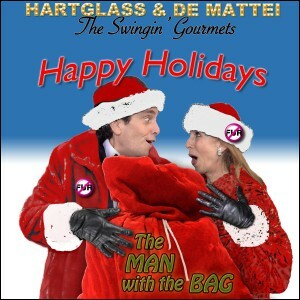 And our gift to you is a song from another of our REAL programs, The Swingin’ Gourmets! You can listen to our holiday song at the REAL website. Wishing you and yours a happy holiday season and best wishes for the new year. P.S. Here are just a few comments we received on our documentary, The Lone Vegan: Preaching to the Fire. Dimitri Frost in New Zealand: I’ve watched your documentary. Thank you sooo much for your generous sharing. Please let me deeply acknowledge you for your courage and your compassionate ways in dealing with the challenge. I could feel the fear myself, just listening to you guys telling the story! I feel that this is what vegan outreach is about. Peace, not war. We cannot point the finger saying they are doing something wrong in ways that make people feel defensive. 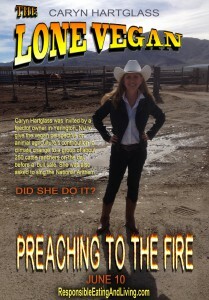 Beth Levine in Maryland: I just finished The Lone Vegan Preaching to the Fire Documentary. I loved it. Very creative and well done. And I learned, too. And I so appreciate that you went. You were a great spokesperson for the animals, very brave, very classy, very open, very approachable, very knowledgeable, very disarming. You never know what leads to what. And I’m glad you had each other for support. Thanks, again, for going and thanks for making the documentary! Valentin Bulboc in Massachusetts: Thanks Caryn for your wonderful work and for the Lone Vegan documentary, I loved it, I’m a vegan myself and looking forward to your podcast episode every week. I’m also interested in environmental issues and music in tune with Universe. Robert Grillo, director/founder of Free From Harm in Illinois: Congratulations! Love the documentary and the concept for it as well. By focusing on being the “outsider,” you’re appealing to a broader audience of people who can relate to what this feels like. I like that perspective.